Former U.S. President Jimmy Carter made history in May 2002 as the first United States president, former or sitting, to visit Cuba since Fidel Castro assumed power in 1959. 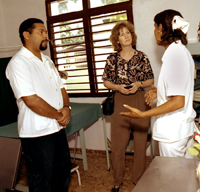 Among those accompanying him on The Carter Center delegation was Dr. Jennifer McCoy (pictured at left with Cuban healthcare workers), director of the Americas Program at The Carter Center and associate professor of political science at Georgia State University. A special trip de-briefing with Dr. McCoy follows. What were the goals for this Carter Center mission to Cuba and were they achieved? President Carter's main goals were to meet Cuban people from all walks of life, to establish a dialogue with President Fidel Castro and other government officials, and to explore ways to ease the relationship between the United States and Cuba. On the first two counts, we visited with Cubans in the city and the countryside, met with the senior members of government, talked with their leading scientists and doctors, met with human rights leaders and independent journalists and librarians, saw an agricultural cooperative, a rural health clinic, and a farmers market, and even met some of their best baseball players. Why do we know so little about Cuba? A small number of Americans visit Cuba each year, in very narrow categories for research and education, journalism, humanitarian efforts, and family visits. The current embargo impedes most Americans' freedoms to learn about our neighbors only 90 miles away, and so, most people know very little about life in contemporary Cuba. What were you able to observe on this historic trip? Across the board, Cubans expressed to us their sincere interest in having better relations with the United States. They want Americans to travel to Cuba, and they want to improve relations between the people of both countries. They also want to be treated with dignity and respect. From dissidents to government officials to ordinary Cubans, they all told me they appreciated President Carter's speech, because even when he boldly criticized some aspects of the regime and Cuban life, he did it in a respectful way, honestly and sincerely. Why did President Castro agree to broadcast President Carter's speech, which called for democracy and human rights as well as for lifting the embargo? When Castro invited President Carter to visit Cuba and again when we arrived at the airport in Havana, he said there would be no limits on who he could meet and what he could say. Before our visit, Castro had said in a press conference that President Carter could speak to a million people in Revolutionary Square and criticize anything he wanted to. President Carter decided instead to accept the invitation to speak at the Aula Magna Auditorium at the University of Havana. It was a courageous move on Fidel Castro's part, and President Carter's speech was equally courageous. It was an unprecedented call in this communist country for personal and political freedoms, made not only to students and faculty, but also to the senior members of the Cuban government seated in the first row. Castro had agreed beforehand that the entire speech would be broadcast live and uncensored on Cuban television and radio. It was quite unusual that we were accorded this honor (only the Pope had given a live broadcast during his visit in 1998). Even more surprising was that they published on their own accord the entire speech and questions and answers two days later in the official newspaper, Granma. What impact do you think the speech had on the Cuban people and on the government? President Carter said before we left for Cuba that he did not expect the trip to change the policies of either the U.S. or Cuban governments. But I think his speech went a long way in Cuba, because of his ability to reach so many Cubans directly through the broadcasts and to express his hopes for freedom, democracy and elections in a respectful way. I hope this will stimulate debate and dialogue among the Cuban people and begin to open political space so that efforts like the Varela Project can get more attention from the public and the government. What is the Varela Project and why is it so significant that President Carter mentioned this in his speech? The Varela Project is a petition drive seeking a national referendum on legislative changes to guarantee rights such as free speech, free association and free enterprise. More than 11,000 signatures were obtained and submitted to the National Assembly just days before President Carter arrived in Cuba. Under Cuban law, the National assembly must at least consider petitions for legislative proposals, though they do not have to hold a referendum. Before the speech, few Cubans had heard about the project since it received no coverage by the state-owned media. Is there any follow-up from The Carter Center on the Cuba trip? President Carter has already briefed members of the House and Senate, as well as President Bush on the trip. We will continue to maintain relations with the Cuban government and with others with whom we met in Cuba. We will be interested to see what happens, for example, with the Varela Project. President Carter called in his speech for the Varela Project petition to be published in the official newspaper so that people can see what it is about, and he suggested having a hearing in the National Assembly so the Cuban people and the deputies in the National Assembly could learn about it. In addition, The Carter Center and the Cuban government have mutual interests in eradicating and controlling diseases in the developing world. The Cuban system of family doctor care and preventive health care is renowned. We will continue to explore any possibilities for cooperation on the health front. What did President Carter do on the trip to advance human rights in Cuba? President Carter had full discussions with the Castro government on human rights issues, among others. He also met with some 30 dissidents and religious leaders-members of the opposition, independent journalists, independent librarians, and representatives from the Catholic, Protestant and Jewish religions-during the trip. The dissidents included Vladimiro Roca, who just prior to President Carter's arrival in Cuba was released early form a five-year prison term for publishing documents criticizing the Cuban government. He also met with Elizardo Sanchez, human rights leader, and Oswaldo Paya, coordinator of the Varela Project. International media coverage brought extensive visibility to their calls for changes in the system of government and to the retribution they have experienced for expressing their views. What did you learn from dissidents on the trip about U.S.-Cuban relations? First, they would like to have more opening with the United States, and they want the travel restrictions to be lifted. Second, they felt that harsh attacks from the United States would not help their cause. Third, even though they need funding, they said they did not want to receive assistance from the U.S. government; they believed such support would discredit their cause as an indigenous one. What is your view on the economic embargo? The best way to create opening is to honor freedoms in both countries. Restricting the freedoms of Americans to travel wherever they want and to trade with whomever they want goes against the principles the Untied States is asking for Cubans. The embargo itself is not the cause of Cuba's economic problems, since it is a unilateral embargo and most other nations in the world trade with Cuba, although it does impact shortages of certain medicines and medical equipment. Lifting the embargo and travel restrictions will encourage the flow of people and ideas between the two countries, which will accelerate movement toward freedom and democracy, something the embargo has failed to do. We at The Carter Center share the same goals as the Bush administration to achieve freedom and democracy in Cuba. The question is how to get there. U.S. policy has been an all or nothing affair-asking for a complete change of government before we will take any step to open our relations. Rarely would a sitting government be expected to voluntarily give up its power. A graduated policy would be more fruitful. We need to be more responsive to create the space that will allow for reforms to come from within Cuba, at the initiative of Cubans. Instead, we have continually raised the bar over the last 40 years of demands for change on the part of Cuba before we will consider making any changes ourselves. This policy invokes a defensive reaction from Cuba. Before President Carter left for Cuba, the State Department said that Cuba might have the opportunity to make biological weapons and to sell such technology to others. What did you learn? President Carter revealed during his tour of the biotech center (Centro de Ingenieria and Biotecnologia) that in briefings by the State Department and intelligence agencies prior to his trip to Cuba, U.S. officials did not tell him of any concerns that Cuba may be supporting terrorist activities. Moreover, in response to President Carter's questions, those officials said there was no direct evidence that Cuba contributes to any foreign country in promoting terrorism. During our trip, U.S. Secretary of State Colin Powell clarified that the State Department's concern was about the capability of Cuba to produce biological weapons and not necessarily the existence of weapons or intent to build weapons. Any country that has basic pharmaceutical capabilities can produce toxins that can turn into biological weapons; having the capability does not necessarily imply having the intent to make those weapons. International inspections would be required to determine whether or not they are actually producing such weapons or transferring technology to others with this intent. Did you see any changes in Cuba that make you hopeful? There has been change in the last decade in Cuba. After the Pope's visit in 1998, there was some increased freedom of religion. In the 1990s after the collapse of the Soviet Union and its subsidies to Cuba, the government carried out economic reforms leading to some free enterprise. For example, self-employed persons can offer their services as plumbers and electricians, and in the agricultural sector farmers and cooperatives can sell privately their surplus produce. We saw such enterprise at a larger farmer's market. There were hundreds of thriving private stalls, where families would sell produce they had bought from cooperatives or from farmers. The state-owned stalls had few customers. We thought this was a true indication of the entrepreneurial spirit of the people, and it has helped to increase agricultural production in Cuba in recent years.